When I come to Italy, I am immediately overtaken with the desire to eat simply. We've intentionally kept our kitchen here very basic - no food processor, no fancy utensils. We only have what we need to prepare available ingredients in the most basic of ways. This suits me fine. I don't come here to cook. I come here to recharge, to work on our wine business, to write, to meet friends, to walk. And because ingredients available here are of the highest possible quality at fair prices, food preparation can be reduced to the minimum. I have a favorite fish stand at the organic market in Alba who we visit every Wednesday when we are here. The fish is brought up from the Ligurian coast just hours before we buy it. My favorite ingredients are always the least expensive and are the classic Italian favorites: fresh anchovies, mackerel, sardines, herring and trout. People often turn their noses up at what they think are "fishy" fish. I challenge anyone who has never had anchovies or sardines or mackerel that did not come out of a bottle or flat can to resist a fresher than fresh filet of these extremely delicious and super healthy fish, marinated in just a touch of olive oil and lemon, sprinkled with sea salt. I rarely bother frying mackerel any more. I just marinate them. Today, at lunch, I served marinated mackerel with a salad I made from shaved fennel (shaved with a cheese grater), cut tomato and lettuce leaves and a loaf of freshly baked bread. It was sublime. Food like this is a gift. It is a balsam for the body and the soul. 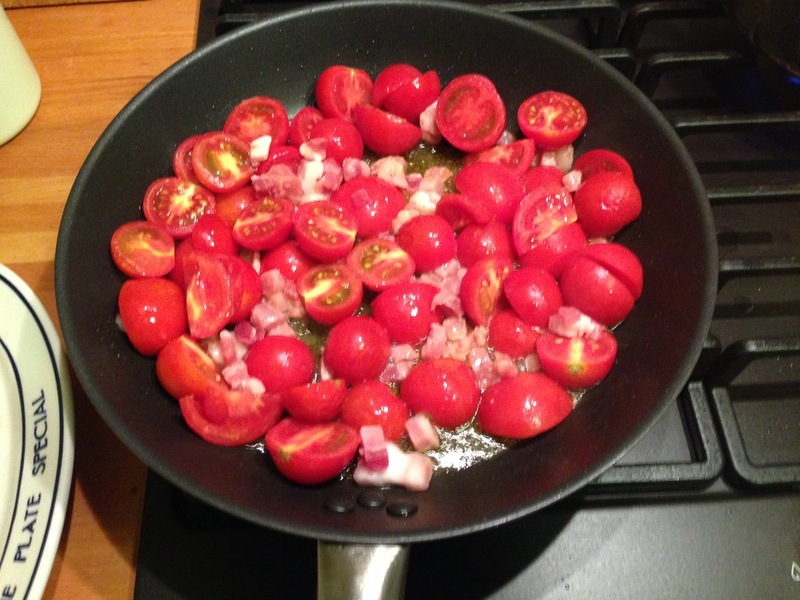 Dinner can be just a panful of slightly over-ripe cherry tomatoes fried gently in garlic and olive oil over pasta or rice or polenta with a little pancetta. There is really no need to get fancy when you can wallow in flavors like this. This is a country where construction workers sit at tables in local restaurants at lunch, drink red wine and eat steaming hot linguine ladled with delicate, fragrant sauces underscored with slow roasted meats and cooked vegetables. It is a country where children, little ones, can be seen downing anchovies and porcini along with their pasta and chunks of 24 month aged Reggiano Parmigiano. In short, it is a country of food experts who understand that quality ingredients, simply prepared, give life meaning. It is one of the things I love most about coming here. Eating like this.